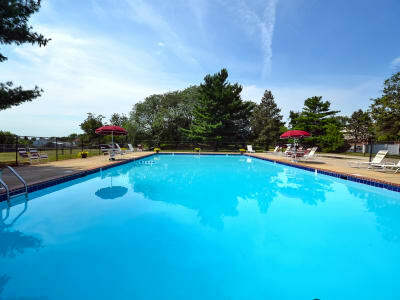 A beautiful setting, fantastic location, smart design details, and thoughtful touches combine to make William Penn Village Apartment Homes your destination for exceptionally comfortable apartment living in New Castle, DE. Many of the bedrooms in our spacious one and two bedroom layouts are large enough for your king bed, and then some. Redesigned chef-inspired kitchens are a pleasure for everyday meals and entertaining. In the community, you’ll find amenities to brighten your day, such as a shimmering pool and sundeck and outdoor fitness stations. The kids will love our onsite playground, and the dogs get their own play area, too. Your Morgan Properties management team is always ready to be of service, with 24-hour emergency maintenance just a call away. Online services help you keep organized and stay in touch, with a resident feedback form, community news, and online rental payments. We invite you to stop in today and find out what makes living at William Penn Village Apartment Homes so special!